概要: We study how hiring public officials affects firms’ ability to win government contracts. By linking personnel transitions of public officials and government construction projects awarded to firms in Japan, we find evidence consistent with the exchange of post-public employment for an increase in government contract awards. Our results suggest that quid-pro-quo arrangements are not made as simple bilateral agreements between an individual public official and a firm, but rather maintained through repeated interactions between generations of public officials and firms, consistent with the model of Salant (1995). 概要: This paper empirically investigates the structure of communication networks among employees within a firm and the impact of the communication networks on their productivity. To collect information on face-to-face communication among employees quantitatively, we use wearable sensors that automatically record data on face-to-face communication among employees wearing them at two offices of a company that provides software support to corporate clients. Using the data, we first show the structure of the communication network using sociogram. Next, we investigate the impact of the communication network on productivity. The results show that an increase in betweenness centrality in a communication network has a positive and significant impact on office performance. Communication between employees can be interpreted as the transfer of their specialized knowledge. Thus, it is considered that an employee’s high betweenness centrality indicates that the employee efficiently gathers information from various colleagues through the communication network. These results imply that the efficient gathering of information through face-to-face communication with various colleagues who have specialized expert knowledge improves productivity by helping to solve complicated problems that employees face. 概要: We empirically examine the distortionary impact of regulatory loopholes on technical change in the context of the Japanese fuel-economy regulation. We construct a model of firm's product choice under technology constraints (i) to substantiate the importance of the distinction between first-stage technology choice versus second-stage choice of product attributes for welfare and policy evaluation and (ii) to generate a testable economic hypothesis that attribute-based technology standards distort technical change when they create trade-offs between product attributes that differ from technically feasible trade-offs. We test this hypothesis in a unique data set on new product launches in the Japanese automobile industry. To control for the Ratchet effect and other time-varying confounders, we exploit the unique quasi-experimental variations in terms of width and stringency of standards across product segments over time, and construct two-fold treatment-control structures within each product segment. We find that contrary to earlier studies, the attribute-based standards did not induce sharp bunching at the notches, yet the differences in attribute trade-offs arising from these notches indeed induced different rates of technical progress, causing substantial distortion in technical change in the Japanese automobile industry. 概要: This study empirically investigates how airport charges affect airfares, flight frequency, and welfare. It estimates a structural model endogenizing airfares and flight frequency by using the data on Japanese domestic routes and conducts simulation analyses. It is found that both types of charges decrease flight frequency. By contrast, while an increase in per-passenger charges significantly raises airfares, per-flight charges have little effect on them. Simulation results suggest that per-passenger charges are superior to per-flight charges from the viewpoints of both airline profits and the social surplus under the conditions of the analyzed market, in which passengers sufficiently evaluate flight frequency. 概要: This research studies present-biased procrastination of U.S. patent examiners. We describe patent examination work as a problem of intertemporal effort allocation by the agent who must complete a task in a fixed deadline, and adopt the standard two-parameter model (β-δ model) to characterize a conflict between short-run and long-run preferences. We apply the model to a large-scale administrative data from the U.S. Patent and Trademark Office with information on daily transaction history of patent applications in the field of Biotechnology and Organic Chemistry. The empirical results support evidence for procrastination by present-biased patent examiners. 概要: Regulatory design of cap-and-trade program involves dynamic considerations: A regulator set up a schedule of permit allocation, which often decreases over time, and decides whether it allows for saving/borrowing of emissions permits across periods. Given such dynamic policy design, regulated firms make abatement and compliance decisions in a forward-looking way. This paper studies dynamic incentives of those firms and equilibrium outcomes under cap-and-trade regulation. I first develop a dynamic equilibrium model of heterogeneous firms that characterizes abatement investment and permit trading subject to transactions costs. I estimate the model using the data from the US Acid Rain Program and evaluate the performance of cap-and-trade through counterfactual simulations. I found that, given a fixed level of aggregate emissions, the costs of reducing emissions under cap-and-trade are 16.6% lower than a uniform standard. Although environmental damages from SO2 emissions increase due to the change in the geographic distribution of emissions, the net-benefit of the cap-and-trade is positive. I also examine the potential gains from trade in the absence of transaction costs. I find more dispersed patterns of investment and less banking of permits, both of which result in cost savings. The Impact of Market Competition on High-Speed Rail Service Quality: Does Monopoly Slow Down a Bullet Train? 概要: We characterize the equilibrium and optimal resource allocations in a general equilibrium model of monopolistic competition with multiple asymmetric sectors and heterogeneous firms. We first derive general results for additively separable preferences and general productivity distributions, and then analyze specific examples that allow for closed-form solutions and a simple quantification procedure. Using data for France and the United Kingdom, we find that the aggregate welfare distortion --- due to inefficient labor allocation and firm entry between sectors and inefficient selection and output within sectors --- is equivalent to the contribution of 6-8% of the total labor input. 概要: A large proportion of the Japanese elderly have accumulated assets in the form of housing wealth. The elderly expect to fund consumption during their retirement by releasing housing equity. This paper estimates a fixed effect model to examine the causal effect of housing assets on consumption, using panel data of Japanese elderly households from 2004 to 2015. The results suggest that changes in housing wealth do not significantly increase elderly consumption. The reason behind this result appears to be that the elderly homeowners cannot release part of their housing wealth as cash through the financial sector. Instead, elderly homeowners leave their housing assets to their children, and in exchange, receiving cash to fund consumption. The impact on consumption, however, is rather small. Moreover, this mechanism tends to operate only in urban areas where the land values are relatively high. These results imply that housing wealth is available to only a limited proportion of Japanese elderly homeowners. 概要: This paper studies the transactions of swordfish from the offshore long line fisheries at the Kesennuma fish market. Each individual fish is sold through a first-price sealed bid auction. We analyze determinants of fish prices in the market. The ordinary least squares estimates show the effects of the fish characteristics, market conditions, date and weather. Furthermore, we apply a structural estimation approach to analyze bid data. We follow a nonparametric approach developed by Guerre, Perrigne and Vuong (2000) to recover the valuation of the bidder and use this to analyze their information rent. Our structural estimates show that winners enjoy considerably high information rents from market transactions. 概要: Exploiting the exogenous and regional nature of the Great East Japan Earthquake of 2011, this paper provides a systematic quantification of the role of input-output linkages as a mechanism for the propagation and amplification of shocks. We document that the disruption caused by the earthquake and its aftermaths propagated upstream and downstream supply chains, affecting the direct and indirect suppliers and customers of disaster-stricken firms. We then use our empirical findings to obtain an estimate for the overall macroeconomic impact of the shock by taking these propagation effects into account. We find that the propagation of the shock over input-output linkages can account for a 1.2 percentage point decline in Japan's gross output in the year following the earthquake. We interpret these findings in the context of a general equilibrium model that takes the firm-to-firm linkages into account explicitly. 概要: Analysis of the urban agglomeration of economic activity has focused on its benefits for firm productivity. But the marginal-cost savings which agglomeration brings about also free up inputs that can be used to produce higher-quality goods, with their own profitability potential. We use plant-product-level data from Japanese manufacturing to examine agglomeration's influences on product quality. Results confirm that quality does grow with region size, suggesting polices aimed at encouraging urban agglomeration improve competitiveness by raising product quality as well as productivity. Total factor productivity alone, therefore, underestimates agglomeration benefits by ignoring the quality incentives that accompany it. 概要: Since the explosion of the Fukushima Daiichi Nuclear Power Plant in March 2011, public anxiety surrounding the radioactive contamination of food and the environment has become widespread. This paper examines how vegetable prices in the Tokyo Metropolitan Central Wholesale Market were affected in the wake of the nuclear accident. This study exploits the quasi-experimental condition generated by this accident to test market price changes using monthly panel data on the price of six types of fresh vegetables from each of the 47 prefectures in Japan. Our estimation results show that the prices of vegetables grown in Fukushima Prefecture decreased by 10-36% after the disaster compared with the counter-factual estimates in the absence of a perceived radiation risk. This effect has persisted even after radioactive detection tests showed negative results in subsequent years. The consumer behavior of avoiding vegetables from Fukushima and instead buying vegetables grown in other areas may explain the price gap. 概要: On a balanced growth path in the standard neoclassical growth model, all technical change must be labor-augmenting, unless the production function is Cobb-Douglas. This result, known as the Uzawa steady state theorem, is at odds with two well-established facts in macroeconomics: (a) the relative price of investment has been falling over time, which implies the rate of capital-augmenting technological change is positive, and (b) the elasticity of substitution between capital and labor is significantly less than one, ruling out the Cobb-Douglas case. We show that this puzzle emerges because previous studies focus only on labor and capital, ignoring other non-accumulable factors, such as land. We develop an endogenous growth model with three factors of production. In the model, firms choose whether to direct technological change towards labor, capital, or land. We show that, even with a less than unitary elasticity of substitution between labor and capital, the endogenously determined rate of capital-augmenting technological change is strictly positive on the balanced growth path, consistent with the observed facts. 概要: This paper empirically analyzes cartel behavior under the presence of detection possibility. Although there have been many convicted cartel cases, little has been known about how possible detection affects cartel behavior beyond anecdotal evidence. Using the case of a cartel in the Japanese cement industry, this paper explores how detection possibility restricted the cartel’s behavior. The estimate suggests that the cartel was worried about detection and the detection possibility restricted the cartel’s behavior. 概要: This paper estimates the degree of mismatch in recent Japanese Labor market. We here focus on the occupational-level mismatch as a gap between the real and optimal number of job seekers in each occupation. Following a flexible approach proposed by Sahin, et., al. (2014), our estimation results show the serious mismatch; the number of new employment is decreased 5〜6 % on average. The paper additionally proposes a new method to evaluate the mismatch of each combination of occupations. Our estimators show the mismatch in a desk work is larger than in other occupations. 概要: This paper examines how liberalization of inward foreign direct investment (FDI) affects firm's monopsonic power over the wage. We estimate firm-level “wage markdown,” the gap between the wage and the marginal revenue of labor (MRL), from firm-level production data of China. Our estimation framework assumes no specific micro-foundation or functional form about firm-level labor supply curves and jointly estimates firm's market power in the output market. We estimate the causal effect of FDI liberalization on wage markdowns, using variations in China’s regulation on FDI inflow upon its accession to the World Trade Organization in 2001. In contrast to the conventional wisdom, FDI liberalization widened the average wage markdown by 4.3%. We show the finding is consistent with a modern theory of labor monopsony based on search friction. 概要: Subjective performance evaluation serves as a double-edged sword in an incentive contract. It can mitigate multi-tasking problems, however, it opens the door for biases, resulting in turnover costs. We provide evidence for both sides of subjective performance evaluation. Using performance evaluation data of new-car sales representatives in a large car sales company in Japan, we show that subjectivity is used to incorporate hard-to-measure tasks, such as mentoring of junior workers and building of long term customer relationship, in an incentive contract. Specifically, we show that (1) the weight for an observable performance measure is a decreasing function of the marginal productivity of a hard-to-measure task, and (2) the weight for a hard-to-measure task is an increasing function of its own marginal productivity. We then use the residuals of the evaluation regressions to construct bias indicators where substantially negative and positive residuals indicate discrimination and favoritism, respectively. We provide tests to show that these indicators capture perceived bias as described in Macleod (2003). We then show that perceived discrimination would substantially increase worker quits. 概要: We derive asymptotic properties of an estimator for supply and demand models extended with additional moments relating consumer demographics to the characteristics of purchased products. We clarify the structure of a practical sampling scheme in which the extended estimator is consistent, asymptotically normal, and more efficient than the original estimator. We provide conditions guaranteeing the asymptotic theorems hold for the random coefficient logit model of demand with oligopolistic suppliers. Extensive simulation studies demonstrate significant benefits of the additional moments in estimating the random coefficient logit model. 概要: Why are product prices in online markets dispersed in spite of very small search costs? Price dispersion in online markets stems from heterogeneity in customers' preferences over retailers; that is, customers choose a set of candidate retailers based on their preferences, which are heterogeneous across customers, and then pick a particular retailer among the candidates based on the price ranking. Thus, some retailers know that some customers will choose them even at high price. The retailers set prices at a level substantially higher than the lowest price. Next, we introduce a stochastic model of online markets, where product prices basically follow a random walk, but sometimes exhibit a sharp decline. In this model, each retailer stochastically places a limit sell order, stochastically reviews its quote price, and revise the quote price if necessary. Customers stochastically pick a particular e-retailer and purchase its product. We conduct a numerical simulation to show that the model successfully reproduces some important facts regarding price dynamics in online product markets, including a Hurst exponent around 0.5, non-autocorrelation of price fluctuations, non-trivial complex correlation of the sign of price changes, and the fat tails of price change distributions. 概要: We explore how changes in ownership and managerial control affect the productivity and profitability of producers. Using detailed operational, financial, management, and ownership data from the Japanese cotton spinning industry at the turn of the last century, we find a more nuanced picture than the straightforward “higher productivity buys lower productivity” story commonly appealed to in the literature. Acquired firms' production facilities were not on average any less physically productive than the plants of the acquiring firms before acquisition, conditional on operating. They were much less profitable, however, due to consistently higher inventory levels and lower capacity utilization-differences which reflected problems in managing the inherent uncertainties of demand in the industry. When these less profitable plants were purchased by more profitable establishments, the acquired plants saw drops in inventories and gains in capacity utilization that raised both their productivity and profitability levels, consistent with acquiring owner/managers spreading their better demand management abilities across the acquired capital. 概要: This paper focuses on non-internationalized supplier firms and investigates how the expansion of overseas activities by their main customer firms affects their employment, utilizing a unique dataset that includes information on buyer-supplier transaction relationships for Japanese manufacturing firms for the period 1998-2007. We do not find any negative effect of top buyers' overseas expansion on domestic suppliers' employment. Instead, we find a significant positive effect. Our result implies that, contrary to fears of a potential hollowing out of domestic supporting industries, the expansion of overseas activities of customer firms has a positive impact on suppliers' employment. Expansion of overseas production by downstream firms may increase purchases from upstream firms in Japan and this would be the case if downstream firms can increase their world-wide sales by expanding overseas production. Therefore, our result suggests that having a transaction relationship with successful downstream multinational firms that expand their global sales through overseas production is important for non-internationalized suppliers in Japan. 概要: This paper investigates the effect of financial shocks on firms' exports. To circumvent endogeneity problems, we utilize the natural experiment provided by Japan's Great Hanshin-Awaji earthquake in 1995. Using a unique firm-level dataset, we single out the effect of exogenous financial shocks on firms' exports by focusing on exports of those firms that were not directly damaged by the earthquake but had main bank relationships with damaged banks. Our main findings are twofold. First, as for the extensive margins of exports, the probabilities of starting exports or of expanding export destination areas were smaller for undamaged firms transacted with a damaged main bank than for those transacted with an undamaged main bank. Second, as for the intensive margins of exports, undamaged firms transacted with a damaged main bank had a lower export-to-sales ratio than those transacted with an undamaged main bank. These findings lend support to the existence of the financial constraint on firm exports. 概要: This paper explores the equilibrium path in a two-country overlapping generations model where new technologies in developed countries (the North) are transferred by imitation to developing countries (the South). We find the equilibrium path of this North--South two-country economy exhibits perpetual fluctuation, including the period-2 cycle, even if the preference and production settings are conventional, e.g. utility of a Cobb--Douglas form. Importantly, when the equilibrium path exhibits perpetual fluctuation, innovation and imitation continue to fluctuate. Consequently, the growth rate of the world economy and the difference in the technology level between the North and the South continue to fluctuate, even while the world economy grows. This finding suggests that the product cycle can be a source of endogenous economic fluctuation. Moreover, the model suggests that the growth path tends to be unstable when imitation in the South is more active than innovation in the North, and this implies that stronger intellectual property rights in the South may stabilize fluctuations in the growth rate of the world economy. 概要: Recent developments in empirical studies have shown that an increase in minimum wage has a non-negative overall employment effect, which is inconsistent with the prediction generated by the textbook competitive labor market model. This paper examines the mechanism that explicitly explains this “inconsistent” evidence by directly estimating how far a plant is from its optimal decision in a competitive environment. In particular, we estimate the gap between each plant's value of marginal product of labor (VMPL) and wage rate using a plant-level dataset from the Japanese manufacturing census. We find that in response to an increase in minimum wage, plants do not necessarily reduce its employment level but experience an increase in the negative gap (i.e., VMPL - wage rate < 0). We conclude that plants are irrational in the sense that they do not cancel out this increase in the negative gap even in subsequent years. Interestingly, the employment effect becomes significantly positive for plants with a small number of competitors in the local labor market. 題目: Does Agglomeration Promote the Internationalization of Chinese Firms? 概要: This study empirically examines the role of agglomeration in enabling firms to begin exporting, using a large dataset of Chinese firms. Knowledge spillover caused by the agglomeration of exporters can reduce the initial cost of export, thereby lowering the “productivity cut-off” required to export. A parametric estimation of an export entry model indicates that the agglomeration of incumbent exporters contributes significantly to export participation, although its magnitude is limited. These spillover effects are generated not only by the agglomeration of exporting foreign invested firms (FIFs), but also, more importantly, by that of indigenous Chinese exporters. In fact, the agglomeration of exporting FIFs only contributes to the export entry of FIFs, but has a negative impact on indigenous Chinese firms' export participation. 概要: This study aims to explain an endogenous emergence of an open patent pool for environmentally friendly inventions, like the Eco-Patent Commons. We achieve this, by thinking of a possibility that private firms internalize production externalities in a standard endogenous and directed technical change model with environmental constraints, in which the final good is manufactured from "clean" and "dirty" inputs and the inputs of each type are endogenously innovated. We demonstrate that, in equilibrium, firms may voluntarily conduct an open-resource patent pool for clean inventions (eco-patent commons). If a coordination cost is negligibly small, this endogenous emergence of eco-patent commons necessarily expands a set of initial knowledge stocks with which the economy can achieve sustainable growth under laissez-faire. 概要: Japan's labor standard law defines weekly legal work hours, and employers must pay a 25-percent wage premium for overtime. The number of legal work hours was 48 in 1987 and gradually declined to 40 by 1997. During the corresponding period, the average weekly hours of work dropped from 45 to 41, suggesting the causal effect of legal regulation on the actual hours of work. Exploiting the different timing of the regulation change by industry and establishment size, this paper estimates the causal impact of legal work hour reduction on labor market outcomes. The analysis results indicate that a one-hour reduction of legal work hours led to a reduction of 0.14 actual hours worked, but it was not accompanied by a reduction in monthly cash earnings. The recruitment of new school graduates was suppressed in response to an increase in the hourly wage rate. 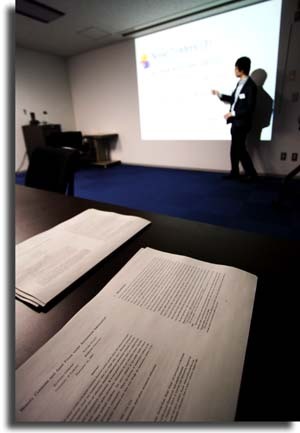 概要: In this presentation, I first briefly provide an introduction to spatial econometrics and spatial discrete choice analysis. Then, I present my paper entiltled "GMM Estimation of Spatial Autoregressive Probit Models: An Analysis of the Implementation of the District Planning System in Japan". The abstract of this paper is as follows: The objective of this paper is twofold. First, on the theoretical level, we propose a feasible generalized method of moments (GMM) estimator for spatial binary probit models containing both a spatial lag latent dependent variable and spatial autoregressive disturbances. Under empirically reasonable conditions, the estimator is consistent and asymptotically normal. We numerically assess the finite sample properties of our estimator using Monte Carlo experiments, and confirm the validity of the estimator. Second on the empirical level, we apply our proposed GMM estimator to actual data for urban planning policies in Japan. In particular, this study focuses on the implementation of the District Planning System in Yokohama city, the capital city of Kanagawa prefecture. The District Planning System is a detailed land use management system introduced voluntarily by the local authorities according to the nature of each district and reflecting the demands of the residents for the local environment. Our results indicate the existence of positive spatial autocorrelations in the utilization of the system in terms of both the dependent variable and the omitted variables. This implies that the inhabitants' preferences for the local environment are spatially autocorrelated, and this is likely because of the interactions between the people in contiguous neighbourhoods and unobservable regional common factors. 概要: Modern economic growth has been encouraged by the expansion of impersonal market trades under governance mechanism with third party enforcement. Third party governance requires the standardization of trade practices, the feasibility of which depends on the features of the goods being traded. While the trade of homogeneous goods such as raw materials is relatively easy to standardize, that of the heterogenous goods is not always easy. Subsequently, a successful economy is one that has achieved a well-coordinated diffusion of impersonal trades from more standardized markets to less standardized ones. In late nineteenth century Japan, which saw the start of the international free trade, treaty port governed by the western consuls worked as a pivot of coordinated modernization of domestic markets. 概要: In Japan it is traditionally claimed that an increase in central subsidies makes local governments “excessively lenient” in granting eligibility for social assistance. On the other hand, it is arguable that this is not actually the case because, due to the very fact that the country is unitary, localities are tightly controlled by the central government. This study examines the traditional claim that more central grants induce localities to provide more public assistance. However, it is difficult to identify such an effect since the matching rates are often nationally identical: the identical rates leave no cross sectional variations and their changes are likely to be marred with aggregate shocks. This study circumvents this identification problem by exploiting two institutional aspects of the system of intergovernmental transfers in Japan. Our results show no support for the traditional claim. In many cases, the effects of central grants on public assistance are not statistically significant. In cases where the effects are statistically significant, their values are either sensitive to specifications, or are evident with signs opposite to what the traditional claim implies. 概要: It has been argued in the economic literature that job search through informal job networks improves the employer—employee match quality, especially in high wage sectors. This paper argues that inventors' research collaboration networks reduce the uncertainty of firms about the match qualities of inventors prior to hiring. We estimate the effect of inventors' collaboration networks on their productivity and mobility using the U.S. patent application database. It is found that network-recruited inventors are more productive and have longer tenure than publicly recruited inventors. The evidence from fixed-effect regressions shows that the higher productivity and longer tenure of network-recruited inventors are not solely attributable to their unobserved ability. These results are consistent with the job match hypothesis between inventors and firms through their collaboration networks. 概要: A news-driven business cycle is a positive comovement in consumption, labor, investment, and output caused by positive news about the future. Standard real business cycle models do not generate it. In this paper, we find that a used market friction - i.e., sticky prices - can be a source of news-driven business cycles from news about future technology growth, technology level, and expansionary monetary policy shocks. The key mechanism is the countercyclical movements of markups through nominal rigidities. 概要: This paper examines the relationship between the return to college and the industry choice of college graduates. We construct a version of the Roy's model, and estimate the probability of industry choice and the returns to college using the Japanese Employment Status Survey from 1982 to 2002. We find that, after correcting the self-selection biases, the returns to college are small in a financial sector and a government sector, although college graduates are more likely to find their jobs in these sectors than high school graduates. We investigate potential causes of this seemingly inefficient allocation of workers across industries. 題目: How Do Small Businesses Mitigate the Cost of Financial Distress? 概要: Financial distressed firms cannot obtain enough credit because the possibility of bankruptcy is high. Therefore, financially distressed firms lose potential profits even when they have profitable investment opportunities, which are called indirect cost of financial distress. However, some small businesses in Japan during the late 1990's are not poor-performing and earn enough profit despite they are in financial distress. Using small business data in Japan, we investigate how these small businesses mitigate the indirect cost of financial distress. First, banks and trade partners do not offer sufficient credit for financially distressed small businesses even if they have growth opportunities. This result is consistent with the previous studies about the indirect cost of financial distress. Second, financially distressed small businesses convert more note receivables into cash by selling them to financial institutions, and use cash holdings more to finance their growth opportunities. These imply that small businesses have several ways to mitigate the indirect cost of financial distress. 概要: T.B.A. This paper estimates a dynamic oligopoly model to assess the economic consequences of a horizontal merger that took place in 1970 to create the second largest global producer of steel. This paper solves a Markov perfect Nash equilibrium for the model and simulates the welfare effects of the horizontal merger. Estimates reveal that the merger enhanced the production efficiency of the merging party by a magnitude of 4.1%, while the exercise of market power was restrained primarily by the presence of fringe competitors. The merger altered the nature of strategic interaction in investment behavior among firms. Our simulation result also indicates that structural remedies endorsed by the competition authority failed to promote competition. 概要: Slack labor market conditions for women relative to men increase marriage rates for young women in the United States. This paper examines the long-term consequences of such marriages using data from the Survey of Income and Program Participation. I find that the marriages induced by relatively poor economic conditions for women reflect shifts in the timing of marriage among young women who would eventually marry anyway. Labor market conditions at age 18-20 do not affect the fraction of women who will marry by age 30. Further, labor market conditions at marriage are uncorrelated with the probability of divorce or with spouses' characteristics, and marrying young in response to labor market shocks does not change the number of children though it shifts the timing of first birth earlier. These findings suggest that temporary shocks to labor market conditions induce only inter-temporal adjustment of marriage timing and do not affect the reservation match quality or the total fertility rate. 概要: This paper studies a dynamic Gaussian financial market model where the traders form higher order expectations about the fundamental value of a single risky asset. Rational uninformed traders are introduced into an otherwise standard differential information economy to investigate the impact of asymmetric information. In a two-period economy, there is a unique linear equilibrium; beauty contests under asymmetric information do not introduce excess volatility driven by self-fulfilling multiple equilibria. The price's reliance on the public beliefs reduces significantly under asymmetric information. When the fraction of uninformed traders is sufficiently large, price volatility increases over time even though the information content of the price increases over time. 概要: This paper tests for the Life-Cycle Hypothesis (LCH), based on a household-level data, by utilizing a change in net pension benefits deriving from the 1999 pension reform in Japan. This exogenous change enables me to identify the substitution effect between the pension and household assets, which can be observed if LCH holds, separately from the inherent positive correlation between them. In this paper, this effect is found particularly for the middle-aged households; moreover, their magnitude is fairly reasonable. Also, findings reveal that less altruistic households behave more consistently with LCH than altruistic households, implying that the estimates of substitutability correctly reflect the variation in household assets in response to the pension reform. 概要: We present a general equilibrium model of international trade with heterogeneous firms in which trade integration affects wages and aggregate productivity by forcing the least efficient firms to leave the market. We then estimate the theory-based gravity equations for Canada-US trade under general equilibrium constraints, and decompose the border effects into: (i) 'pure' border effects; (ii) relative and absolute wage effects; and (iii) selection effects. Using the estimated parameters of our model, we finally conduct various counterfactuals on the impacts of trade integration on wages, productivity, markups, the share of exporters, the mass of varieties consumed and produced as well as welfare. 概要: The existence of human capital externalities is typically considered as one of rationales for government interventions into education. However, the necessity for education policies would vary with cultures in societies, since people may evaluate social esteem as a return to investment in human capital. This paper introduces preferences for social status based on human capital holdings into the Uzawa-Lucas model, and investigates the relationship between status desire and positive human capital externalities. The existence of status desire stimulates growth of the economy. However, it may induce excessively fast accumulation of human capital. The value and sign of the optimal rate of subsidy to education, which represent the needs for education policies, depend on the strength of status desire. It is also shown that, in the presence of status desire, flat rate wage income taxes are no longer neutral to the equilibrium allocation. 題目: "Technology Shocks and Asset Price Dynamics: The Role of Housing in General Equilibrium"
概要: A general equilibrium model, that incorporates endogenous production and local housing markets, is developed in order to explain the price relationship among human capital, housing, and stocks, and to uncover the role of housing in asset pricing. Housing serves as an asset as well as a durable consumption good. It is shown that housing market conditions critically affect asset price correlations and risk premia. The first result is that the covariation of housing prices and stock prices can be negative if land supply is elastic. Data from OECD countries roughly support the model's predictions on the relationship among land supply elasticity, asset price correlations, and households' equity holdings. The second result is that housing rent growth serves as a risk factor in the pricing kernel. The risk premium becomes higher as land supply becomes inelastic and as housing services become more complementary with other goods. Finally, the housing component in the pricing kernel is shown to mitigate the equity premium puzzle and the risk-free rate puzzle. 題目: "Educational Gender Inequality and Inverted U-Shaped Fertility Dynamics"
概要: In this article, we examine the dynamic interactions between narrowing educational gender inequality and inverted U-shaped fertility dynamics by constructing a two-period overlapping generations model that includes both sexes. In the early stage of development, neither males nor females are educated. At some period, males begin to be educated, whereas females remain uneducated. At this stage, the males' education levels, as well as the fertility, gradually increase over time. Fertility achieves a peak just before the onset of the female's education. Subsequently, fertility steadily decreases over time. Gender inequality in education also decreases during periods of fertility decline. 概要: This paper suggests that people can learn to behave in a way which makes them unlucky or lucky. Learning from experience will lead them to make choices which may lead to ``luckier'' outcomes than others. By so doing they may reinforce the choices of those who find themselves with unlucky outcomes. People have reasonably learned to behave as they do and that their behaviour is consistent with their experience. The lucky ones were not ``born under a lucky star'' they learned to be lucky. 概要: We consider the tasks on the Japanese economy in details. First, we estimate the production function of each industry with prefectural panel data. Then, we select “Data Envelopment Analysis (DEA)” model from the Returns-to- scale of each industry by this estimation's results. Finally, we implement DEA to evaluate the production efficiency by industry and prefecture in the economic center areas. The empirical results show that all economic activities with high added value have concentrated in only Tokyo; because of the redundancy reaching around 8-9% of total input amount, we have to reform regional economies and social security policies. 概要: Truthful revelation of preferences has emerged as a desideratum in the design of student assignment mechanisms in school choice programs. Gale-Shapley's deferred acceptance mechanism is strategy-proof for students but limits their ability to communicate their preference intensities. This results in ex-ante inefficiency when ties at school preferences are broken randomly. We propose a practical deferred acceptance mechanism which allows students, via signaling their preference intensities, to influence how they are treated in ties. It maintains truthful revelation of ordinal preferences and supports a greater scope of efficiency, a new notion that helps us to compare mechanisms on the efficiency ground. 概要: A conventional wisdom in economics posits that more intense market competition, measured in almost any way, reduces firm profit. In this paper, we challenge this conventional wisdom in a simple Cournot model with strategic R&D investments wherein an efficient firm (dominant firm) competes against less efficient firms (fringe firms). We find that an increase in the number of fringe firms can stimulate R&D by the dominant firm, while it always reduces R&D by each of the fringe firms. More importantly, this force can be strong enough to compensate for the loss that arises from more intense market competition: the dominant firm's profit may indeed increase with the number of fringe firms, quite contrary to the conventional wisdom. An implication of this result is far-reaching, as it gives dominant firms to help, rather than harm, fringe competitors. We relate this implication to a practice known as open knowledge disclosure, especially Ford's strategy of disclosing its know-how publicly and extensively at the beginning of the 20th century. 概要: This paper studies the role of a seniority based profit and task allocation system in a firm. The firm chooses either a farsighted or a shortsighted action in each period. The former corresponds to keeping or rebuilding a good reputation, while the latter to cheating consumers. We assume that even if the firm chooses the farsighted (shortsighted) action, it may get a bad (good) reputation with positive probability. In this situation, we show that an effcient seniority system helps to maintain a good reputation in the sense that the farsighted action profile is sustainable in equilibrium. 概要: The empirical literature on trade liberalization reflects two puzzles. First, the effect of trade liberalization on economic growth is ambiguous. Second, the effect of trade liberalization by developing countries on their income distribution is also ambiguous. This paper attempts to explain these two puzzles at the same time, based on a multiple-cone neoclassical growth model. The model shows that countries that are labor abundant in a global sense may see a rise in income inequality and a decline in per-capita GDP and per-capita consumption with liberalization if they are capital abundant in a local sense. The results suggest that two puzzles can be explained by the existence of global and local factor abundances. 概要: The proportion of part-time, dispatch and temporary workers has increased in many developed economies in recent years. These workers receive lower average wage and benefits and are subject to lower employment stability. This paper analyzes the effects of initially taking such jobs on the employment career of young workers. We build an on-and-off-the-job search model, use Japanese data to perform a structural estimation of the model parameters and simulate career paths to study the effect of the initial choice of employment on the probability of having a regular job in the future and on the welfare of the worker. We find that although contingent jobs are neither stepping stones towards regular employment, nor dead ends, starting a worker's career in a contingent job has a lasting effect in terms of the welfare of the individual in Japan. 概要: This paper develops a model with search to examine the determinants of the amount of capital purchased by a firm for workplace safety and investigates a relationship between unemployment and the incidence of work-related injury or illness. Productivity improvement encourages firms' entry and therefore lowers the unemployment rate but instead raises the employment rate, including the fraction of absent workers (scale effect). On the other hand, productivity improvement encourages firms to buy more capital for workplace safety (capital effect). This biases the distribution of employed workers toward non-injured workers, lowering the fraction of absent workers. These two effects determines the relationship between unemployment and the incidence of work-related injuries or illnesses. The empirical exercises confirm that the scale effect had been dominant over the capital effect over the sample period in the US; that is, the unemployment rate and the flow rate of work-related injured workers moved in the opposite direction, but that a movement in the same direction is observed only from the late 1980s to the mid 1990s, so called the period of economic slowdown after the burst of "Bubble Economy" in Japan. 概要: This paper analyzes the locations of heterogeneous firms, which are differentiated by indices in [0, N], when communication externalities generate agglomeration economies. The benefit of a communication decreases as the cognitive distance between two firms increases. An interregional communication requires travel costs while no cost for intraregional communications. There are also agglomeration diseconomies arising from rise in wage rate. We categorize the solutions into four configurations: unique equilibrium of agglomeration, unique equilibrium of partial agglomeration, unique equilibrium of dispersion, and multiple equilibria of agglomeration and dispersion. Agglomeration is likely to occur when the communication benefit and the travel cost are large. 概要: This paper develops a dynamic general equilibrium model of North- South trade and economic growth in a world economy with a continuum of countries. Countries are different in research productivity. Innovation,　imitation and the relative wage between countries are endogenously　determined as well as the number of countries that are specialized in innovative and imitative R&D. We investigate how equilibrium is affected by globalization, intellectual property right protection, industrial policy, competition and migration. The model is also extended to introduce foreign direct investment. 概要: Rarity can refer to two distinct meanings. On one hand, it refers to prestige associated with rarity value. Goods with such premia are traded as if they were differentiated products even when they are functionally not much different from their non-rarity substitutes. On the other hand, rarity can simply mean infrequency without extra prestige. In the presentation, these two alternative contexts are discussed in respective thought-experimental models considering (i) Rarity with prestige and (ii) Rarity without prestige. 概要: This paper investigates how tax projections and economic growth forecasts are affected by the maneuverings of government bureaucrats who take account of the increasing government fiscal deficit and debt in Japan. The empirical results suggest that income tax projections are an unbiased predictor of actual tax revenue given certain economic growth forecasts. On the other hand, we reveal that corporate and consumption tax projections are underestimated based on the accumulated government debt and fiscal deficit. We also analyze the maneuverings of the bureaucrats on economic growth forecasts and find that the government forecasts economic growth rates using the scale of the fiscal deficit. 概要: What is the source of asset price fluctuation? Does asset price fluctuation affect business cycle? To address these two questions, we construct a dynamic general equilibrium model with assets and time-varying wedges, which resemble productivity, distortionary taxes and government consumption. These wedges are measured so that our model accounts for the observed data perfectly. One of important points is that our model covers a large class of frictional business cycle models. In the present paper, as an example, we focus on Japan during 1980-2003 which experienced large movements of asset prices and business cycles. Measured wedges tell us that (i) the key for asset price fluctuations is frictions which affect asset markets while frictions which affect productivity have little effect on asset prices, and (ii) through spillover effects among wedges, asset price fluctuations affect business cycles. Especially, for the Japanese economy, we find that (i) the boom during the late 1980s might be led by the great reduction of frictions of corporate share market. However, (ii) the slump during the 1990s is not affected by asset market frictions, and the main problem is frictions which affect productivity. We also find that (iii) frictions which affect productivity and consumption-labor choice, might have important roles to account for the declines of asset values after 1991. 概要: This paper develops a theory of sustained growth that does not depend on the exponential growth of any variable. Existing theories of endogenous growth explain long-term growth in terms of either the exponential growth of physical output, improvements of quality of goods in an exponential rate, or the exponential growth in the variety of goods. However, to obtain those results, those theories typically need to assume some knife-edge properties on the form of positive spillover effects. Using a variety expansion model, this paper shows that those assumptions can be relaxed once we allow price/productivity heterogeneity among goods and variable elasticity of utility function on each goods. In this setting, we derive an asymptotically steady-state equilibrium in which the rate of GDP growth and the number of new goods introduced per unit time, instead of the growth rate of the number of goods, are asymptotically constant. 概要: In this paper, we analyze the strategic interaction between siblings who choose their residential locations in order to receive childcare assistance from their parents. Our three-stage game yields a theoretical result that a first-born child lives closer to his/her parents than a second-born child, which is supported by our estimation results using Japanese micro data. We also show that the childcare assistance from parents is one of the main determinants of the residential location choice of siblings. This paper is the first to succeed in explaining the residential location choice of siblings in Japan using economic incentives. 概要:This paper focuses on the skill formation when the trade impacts on labor markets. Although workers are identical as unskilled labor, they differ in their productivity as skilled. Workers become skilled by incurring the training costs. Introducing the above settings into a trade model with monopolistic competition, we show that trade opening enhances skill formation. This is because trade enriches the variety of differentiated goods and increases the utility of a worker for a given income. This effect is stronger for skilled workers than for unskilled workers, although it makes all agents better off, leading to higher skill formation. However, it may be accompanied by increases in real wage disparity between skilled and unskilled workers as well as in skilled wage inequality. Finally, we examine the possible effects of foreign direct investment on the labor market structure as well. 概要: In this paper, we provide an empirical analysis of evolving networks of successful R&D collaborations in the IT industry in the U.S. between 1985 and 1995. We first show that the network has become more extensive, more clustered, and more unequal in the sense that 'stars' have emerged in the network. We then run regressions in which we control for firm similarity, including unobserved similarities inferred from the community structure of the network. The results indicate a significant cyclic closure effect and a preferential attachment effect. 概要: This study examines the effect of the yardstick inspection system in Japanese gas industry on reducing information disadvantage of the regulator. The Japanese government regulates the price of city gas supplies by combining an (ex-ante) yardstick inspection and a fixed-price contract. Theoretically, the current regulation may bring the society to the first best outcome because the yardstick gives firms an incentive to report the true cost and the fixed price contract gives firms an incentive to exert the best efforts. It is known, however, that a yardstick hardly works perfectly and the purpose of the study is to measure its effect. Taking the current regulation as given, we estimate the cost function of the gas suppliers under the assumption of asymmetric information between the regulator and the regulated firms. Although we do not observe the ex-ante behavior of the firms, the estimation does not require the ex-ante data but the ex-post data. Unobservable such as effort and inefficiency levels are recovered. Using the recovered parameters, we calculate the welfare levels under the current, the first best, and the second best regulations. The welfare difference between the current and the first best regulations implies the extent of distortion from the adverse selection problem. We examine whether the introduction of the yardstick significantly reduced such a distortion. The result suggests that the Japanese yardstick did not improve the information disadvantage of the regulator, but rather worsened it. 題目:Joint Production Subsidiaries: Are they all welfare-enhancing? 概要: Using a structural model of new economic geography, we estimate the effect of accessibility to foreign knowledge on international income distribution. Whereas previous literature has mainly focused on the importance of geographical accessibility to foreign markets, this paper emphasizes the role of accessibility to foreign knowledge in determining international income inequality. Using cross-country data of income per worker, bilateral trade flows, and number of flight passengers, we find evidence that the accessibility to foreign knowledge raises per capita income significantly. 概要: We investigate how patent policy affects economic growth in an endogenous growth model in which both innovation and capital accumulation are driving forces of economic growth. In endogenous growth models with only innovation, tightening patent protection necessarily enhances economic growth. In the present model, stronger patent protection raises the rate of innovation but reduces the rental rate of capital, and thus accelerates innovation but discourages capital accumulation. Consequently, strengthening patent protection may reduce the growth rate of output. This result contrasts with those of growth models with only innovation. In addition, the growth-maximizing degree of patent protection is lower than the maximum degree of patent protection. We also investigate how patent protection affects social welfare and show that the welfare-maximizing degree of patent protection is lower than the growth-maximizing degree of patent protection. 概要: This paper develops a growth theory that accounts for the evolution of trade policy, underlying internal class conflicts, and global income divergence over the last few centuries. By analyzing political responses to the distributional effects of international trade, this paper finds a prominent interaction between trade policy and the pattern of economic development, and suggests that the nature of the interaction depends on a country's resource abundance and distribution. As shown by the example of Western Europe, land-scarce countries will reach a developed stage through a non-monotonic evolution of trade policy. In contrast, land-abundant countries, especially those with concentrated landownership, tend to fail to take off because of landlords' opposition to industrialization. 概要: Human tasks are often multidimensional. Holmstrom and Milgrom (1991) concluded that high-powered” incentives cannot work unless all dimensions of these tasks are observable in the firm. However, as this study shows, if the firm can observe the price vector of its products in the market, distinguish each dimension of the price vector, and connect the information with signals from workers in the firm, then the use of multidimensional“high-powered” incentives becomes feasible. Product differentiation with committed quality satisfies those conditions, which has been practiced by the Japanese, but not by the Western, manufacturing for a century. 概要: Olympic athlete selection procedures are different among countries and events, and famous athletes are often reported to have lost their selection races. This paper analyzes what type of procedure is more likely to select high-ability athletes while preventing low-ability athletes from being selected by chance. Our game-theoretic model shows that holding one race only is more likely to select high-ability athletes than evaluating each athlete's best or average record in multiple races with voluntary participation. The effect of injury, which prevents athletes from participating in particular races with a positive probability, is also examined. 概要: In this paper, we investigate whether the credit contagion decrease the trade credit supply for small businesses using micro data. Japanese economy experienced a large recession after 1997 and the number of dishonored bills and bankruptcy filings caused by domino effects increased. If many suppliers worried about default of customers due to credit contagion, they might withdraw more trade credit from customers even though the credit risk of customers is low. We find that trade payables decrease during the large recession, especially for manufacturers and wholesalers. Also, the credit contagion reduces more trade credit for risky and non-risky small firms in manufacture. However, the effects of contagion are weak for other industry. 概要: In the theoretical part of the paper, we present a spatial economy with homelessness for a monocentric city. We demonstrate that homeless people tend to occupy public space located at the center of the city because of savings in transport cost and the presence of network externalities. This location choice mechanism drives the geographic concentration of homeless people in the heartland of city. Using a conditional logit model for location choice of homeless people, and a spatial autoregressive model for a geographic distribution of them in Osaka City, we obtain results that are consistent with the theoretical predictions. 概要: Because the demand for the transport services stems from that for the final goods, the sizes of the transport sector and the final goods sector in an economy depend on each other and are determined simultaneously. If there is a distortion in the transport sector, notably a distortion arising from the imperfect competition, however, its size realized by the market mechanism may differ from the socially desirable one. In this paper, I examine how the consequence of the market mechanism differs from the social optimum, considering the first best policy, the price regulation and the entry regulation. 概要: Diverging economic inequality has become a common focus of economic debate in developed countries. In particular, the recent experience of Japan has started attracting international attention. We take advantage of a rich micro-level data set from the Basic Survey on Wage Structure (1989-2003) to perform an in-depth analysis of the change in the inequality and distribution of the hourly wage. We observe that lower returns to education and years of tenure contribute to diminishing income disparity between groups for both sexes. A larger variance within a group contributes to the wage disparity for males, while an increased heterogeneity of workers' attributes contributes to the wage disparity for females. The Dinardo, Fortin, and Lemieux decomposition also confirms the basic findings from a parametric variance decomposition. 概要: We present an econometric approach to the problem of detecting bid rigging in procurement auctions using bidding data in auctions for paving works in Ibaraki City, Osaka, Japan. We first show that sporadic price wars are caused by the participation of potential “outsiders.” Assuming that the ring is all-inclusive in the absence of these outsiders, we estimate the rule by which the ring selects the winner. It is found that the ring tends to select a bidder whose time elapsed from the last winning is long and whose winning amount in the past is small relative to other bidders. 題目: "The Long-Term Care Problem, Precautionary Saving, and Economic Growth"
概要: This paper examines the interaction between decisions about financing after-retirement health shocks and precautionary saving motives, and how this interaction affects economic development. We show that at low levels of income, individuals choose not to save to finance the cost of after-retirement health shocks. However, once individuals become sufficiently rich, they do choose to save to finance the cost of these shocks. This change in individual saving behavior may give rise to multiple steady state equilibria. 題目: "Growth, revenue, and welfare effects of tariff and tax reform: win-win-win strategies"
概要: This paper examines the role of intellectual property rights (IPRs) in determining the rates of innovation and economic growth in a quality ladder model of endogenous growth. In the model, the degree of IPRs protection is specified as a policy variable which controls the rate of imitation occurring in monopolistic sectors. Stronger IPRs protection increases the expected duration of monopoly, giving a larger incentive to innovate. In the long-run, however, it increases the number of monopolistic sectors, where R&D are less active than in competitive sectors because the incumbent monopolist has little incentive to innovate (the Arrow effect) and because outsiders have to incur a large cost to innovate due to technological disadvantages as well as legal restrictions imposed by the IPR of the incumbent. If the latter effect dominates, strengthening IPRs does not necessarily enhance growth. The existence of a noncorner IPRs policy for maximizing growth is established in several settings. 概要: In this paper, collusive price leadership in homogeneous good capacity-constrained repeated price competition is examined. In the stage game, firms choose their timing of price setting. Although setting a price early is disadvantageous per se, a large firm has an incentive to move early in order to demonstrate its commitment not to deviate. If the discount factor is not too large, this behavior raises the collusive price compared to that arising in collusion with simultaneous moves. As a result, all firms obtain (strictly) higher profits. 概要: This paper presents a model that can account for the gender segregation of skill acquisition when the marriage market is competitive. We in particular show that when the burden of domestic activities, arising most notably from childbearing and child rearing, is asymmetrically placed on married women, there arises an incentive for them to deliberately degrade the quality of human capital investment. We then argue that this incentive can be excessively strong and gives rise to the emergence of an inefficient asymmetric equilibrium where a bulk of women concentrate exclusively on the acquisition of less productive skills in the market. The analysis reveals that an effective way to eliminate this inefficient outcome is to compensate married women for the opportunity cost of domestic activities, thereby reducing the earnings differential between single and married women, rather than to directly subsidize the acquisition of marketable skills. 概要: In this paper we examine the degree to which the human and economic casualties caused by natural disasters are reduced as an economy develops. We use data over the period 1960-2003 on human and economic losses resulting from natural disasters collected by the Office of U.S. Foreign Disaster Assistance/Center for Research on the Epidemiology of Disasters (OFDA/CRED) to estimate the relationship between the level of economic development and the damages caused by natural catastrophes. We find that as income rises the deaths are reduced, but that economic damages rise. However, damages as a proportion of GDP fall as income rises. Thus, the relative human and economic losses are most serious in developing countries. Controlling for income, we also find that countries with greater human capital and more openness experience fewer human and economic losses from disasters. The results are relevant to both policymakers and field agencies engaged in assessing and setting disaster mitigation policies. 概要: This paper examines how different education systems change GDP through their influence on the diversity of human capital. It shows that diverse human capital induced by heterogeneous income always lower GDP, while diverse human capital induced by heterogeneous ability can increase GDP if produced goods are sufficiently substitutable and firms have the large span of control. Hence, a tax-financed education system yields higher GDP than a self-financed education system, though the effect of ability tracking on GDP depends on the structure of industries and firms. 概要: By a duopoly model with product differentiation, this paper examines interaction between trade liberalization in commodities and foreign direct investment (FDI) in services. After consumers buy goods, a certain fraction of foreign units is broken and the consumer can repair the broken units by purchasing repair services. Without service FDI, trade liberalization encourages the domestic firm's entry into the service market, and it may reduce imports, benefit the domestic firm, and hurt the foreign firm as well as consumers. With service FDI, trade liberalization has the usual effects. The result suggests the importance of service trade liberalization. 概要: We examine gains from trade in a small open economy model with the　inter-industry interaction caused by pollution. In our model, the economy is diversified in the trading equilibrium so that it cannot avoid the negative impact of pollution through the spatial separation of production. First, we show that free trade may harm the economy depending on the trade pattern and the level of a pollution tax. Second, unless a pollution tax is optimal, the introduction of new pollution-reducing technology can harm the economy even if it is costless. We also derive a similar result under tariff policy. 概要: We analyze the effect of the Byrd Amendment, which amended the US Tariff Act of 1930 to allow revenue from antidumping duties to be distributed to domestic import-competing firms. In an international duopoly framework it is shown that it urges the home firm to restrict output so that the foreign firm increases output and that revenue from the duties increases. Consequently, not only the home firm but also the foreign firm can be better off while only consumers are worse off. Home total surplus increases if the foreign rival firm is much more efficient, but otherwise decreases. 題目: "Inventing Around and Litigation under Asymmetric Information"
概要: This paper studies a model of patent licensing when there is a possibility of inventing around. We show that licensing is still useful as way to avoid litigation although the licensing fee declines with ease of inventing around. We show that litigation occurs only if there is asymmetric information regarding thepotential entrant's ability of inventing around. We also examine possible consequences of pro-patent policies, such as introduction of punitive damage awards and a more aggressive use of the doctrine of equivalents. We show that these policies may increase the number of litigation but may reduce the probability of patent holder's success. 概要: We analyze a class of `large group' Chamberlinian monopolistic competition models using multiplicatively quasi-separable (MQS) and additively quasi-separable (AQS) functions. We prove that the MQS and AQS functions are equivalent to the `constant relative risk aversion' (CRRA) and `constant absolute risk aversion' (CARA) classes of functions, respectively. Whereas both approaches allow for closed-form solutions, only the AQS functions yield profit-maximizing prices that decrease in the mass of competing firms. We characterize the equilibrium in both cases and discuss some possible applications of the AQS framework. 題目: "Intergenerational Strategic Complementarity in a Growth Model	with Education"
概要: Constructing an overlapping generations model with physical and human capital accumulations, this paper explicitly examines the relationship between the intergenerational strategic interaction and the patterns of economic growth. We show that, depending on the expectations held by the overlapping agents, the long-term pattern of growth in the model can be either a convergence to a steady state as in a standard neoclassical growth model, a balanced growth as in a standard endogenous growth model, or permanent growth cycles associated with the transitions of its growth process: for some periods the economy behaves alike neoclassical growth model, followed by the behavior like endogenous growth model for some periods. 概要: We analyze the formation of Free Trade Agreements (FTA) between a developed country and developing countries. The form of FTAs affects the trade structure in the region, as the firms from countries not part of the FTA will choose between exporting to the developed member of the FTA or engaging in an FDI into one of the developing countries. Their decisions depend on the tariff-included cost differences in the choices and fixed cost for FDI. The members of the FTAs are in a conflicting position regarding this issue, as an increase in the number of FDI is beneficial for the developing members while a decrease is better for the developed member. This conflict of interest can cause tariff levels to move generally in the decreasing direction. Finally, we analyze how the developing countries would act before the inception of FTAs. We conclude that they have an incentive to form a customs union to strengthen their bargaining position. This may have been one of the issues behind the formation of MERCOSUR in South America.